Synopsis: Dysphasia is a poorly understood language disorder. The director Christine Rabette, went to meet parents and their dysphasic children, and recognized professionals in order to deliver a reference pedagogical tool. 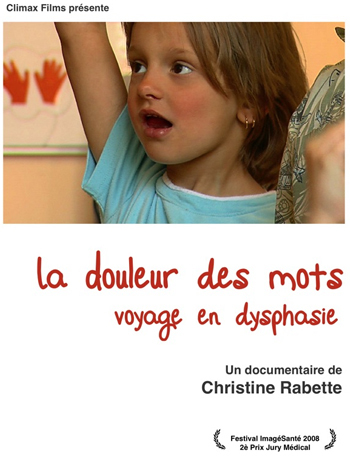 Made especially for the DVD of La Couleur des Mots (The Colour of Words), it is aimed primarily at the people concerned: parents and relatives, teachers, speech therapists, and educators; and it answers the most frequent questions: diagnosis, definition, management, associated disorders, evolution, and everyday life.